How We Increased Sales Opportunities 4X With Video: A HubSpot Experiment - Brighten Production Inc.
Let’s talk about a trend, shall we? Think about the number of times in the last week when you’ve read something on Facebook. Now, compare that to the number of times you’ve watched something on Facebook. Those numbers are probably pretty staggered toward video, right? And if so, you’re not alone -- right now, there’s a big demand for more video content all around. But that demand -- like the fact that marketers who use it grow revenue 49% faster than non-video users -- gave us an idea. What if we used video to help our sales reps and process? After all, given the aforementioned content consumption preferences, it seemed like people might not want to read tons of sales emails -- but they might be interested in watching a video from a rep.
We're always on the lookout to help our sales reps book more meetings. We call that the prospect:connect rate, which summarizes the efforts of reps to get responses (connect) when they reach out to leads to propose booking a meeting (prospect). So, our objective was to improve sales connect rate, and create more sales opportunities. And since videos are a highly popular content format, we wanted to see if adding that to our traditional outreach mix could help. So, how did we test that theory, and what were the results? Let’s dive right in. Video doesn’t hinder overall activity levels. Sure, recording and sharing visual content like this might seem more time-consuming than sending an email, or making a quick phone call. Could reps send tailored, personalized videos to their prospects and still hit activity benchmarks? Video will be more engaging than emails or phone calls. Are people more likely to answer an email with video -- and actually play the video -- than they are a regular email, or a voicemail? Videos will be more efficient at creating opportunities than emails or phone calls. By adding video to the traditional call and email cadence, more prospects would book meetings, thus improving our connect rate. First, we wanted to determine how we could help reps take what they were already doing via email -- being consultative, being helpful, and providing actionable tips -- and present it in a more visual approach. Ultimately, that came in the form of short video inbound marketing assessments (IMA), in which reps talk through a prospect’s areas of opportunity in their marketing and problems that can be addressed. It’s what our salespeople go through with each and every prospect during an initial call. By including this video, we aimed to spark the propsect's interest by giving them a taste of what they would get if they booked a meeting. We used a simple Chrome browser extension tool that would allow our reps to record their tabs, screens, faces, and voices with one click. It also allowed them to seamlessly insert those videos into emails to prospects with a single click -- and track any action recipients were taking with those emails. Beyond figuring out the technology, we needed some parameters around our experiment. We ran the test for 45 days, enrolling five of our corporate business development representatives (BDRs), and training them with expectations of how we saw them best using this approach. They had one overarching goal: Meetings booked. How well could the BDRs get prospects not just to respond, but to actually book time with them? Hypothesis 1: Video doesn’t hinder overall activity levels. To test this hypothesis, we tracked the composition of each BDR’s activity over the span of the experiment. 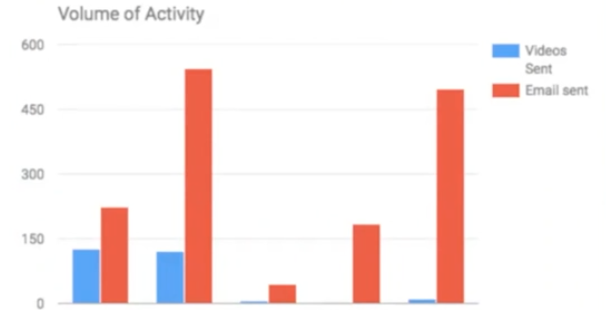 As depicted by the chart below, the two BDRs who most actively used video had the most productive months overall, across different activity types. The reps who didn’t use video were also successful, but by no means was video a hindrance to productivity. The takeaway: Sales reps can use video and still be productive. Hypothesis 2: Video will be more engaging than emails or phone calls. To test this hypothesis, we looked at the overall volume of activity. 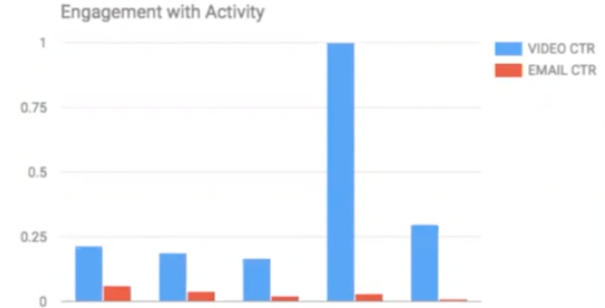 How many videos did the five reps send over the course of the experiment, compared to the number of emails they sent overall during the same time period? We also measured the level of engagement with those emails -- the clickthrough rate (CTR) of emails with video, compared to emails alone. Have a look at the two charts below. The number “1” indicates a 100% CTR. 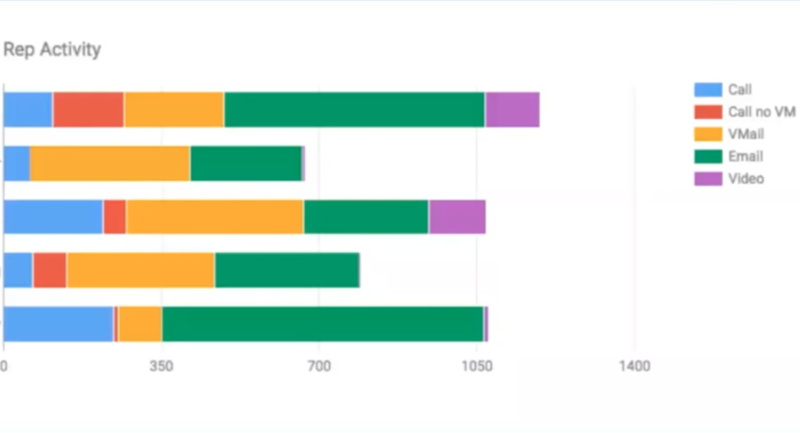 For the sake of transparency, it’s important to note that the second BDR from the right only sent two videos, which skewed the video CTR rate to look especially high. But if you look across the board at all the reps -- who, as the first chart indicates, sent a ton of email -- you’ll see that the CTR of the videos was far higher than that of standard templated emails. The takeaway: Video messages are more engaging than email or phone calls. Hypothesis 3: Videos will be more efficient at creating opportunities than emails or phone calls. Calls or emails alone to meetings booked. Emails with videos to meetings booked. When we looked at the reps’ overall activity -- including email -- compared to their meetings booked, we saw about a 1.5% conversion. In other words, for every 100 emails, voicemails, or calls that they made, they would book about one meeting. However, when we looked at video alone, we saw that the ratio of videos sent to meetings booked was 6%. That’s 4X higher than all other activity combined. The takeaway: Over the course of running this experiment, roughly 4% of our activity was comprised of video, which might look low. But 14% of the opportunities created that month came from video -- which are pretty promising results. Overall, the results were encouraging, with the hypotheses largely proving to be true. Given the limited timeframe of the experiment, we’ll continue to see how the incorporation of video into our reps’ outreach efforts performs long-term -- but in the meantime, we established a few takeaways, lessons learned, and best practices that we hope add as much value to your own efforts. Reps and managers need to be “bought in.” The two out of five reps who saw the most success with video prospecting were also the ones who were the most enthusiastic to use it, and the ones whose managers were the most encouraging. Like the art of writing a great sales email or leaving a memorable voicemail, it's not something that can be mastered overnight. Be willing to forego quantity for quality. Simply put, reps can’t send as many high-quality, personalized videos as they can send high-quality, personalized emails. That said, balance the mix of your outreach so that you don’t lose out on overall activity. Have you ever done a similar prospecting project? Comment below with your best experiments and hacks to increase sales opportunities (and hey, we might even feature your experiment on our blog).